Why X1 BladeFins? Maximize every kick for raw thrust. Maximize every dollar for great value. Firmer, shorter blade design to maximize kicking power. Solid internal frame delivers more control. Maneuverability for tight spaces. Perfect for general purpose diving, tech diving and extreme applications. Great for alternate kicking styles – helicopter, scissors, frog-kick and more. X1 BladeFin Design Legendary Atomic Aquatics design and quality. 1. Rigid Low-Profile Side Rails and Shorter, Stiffer Blade Makes turning and pivoting easier. 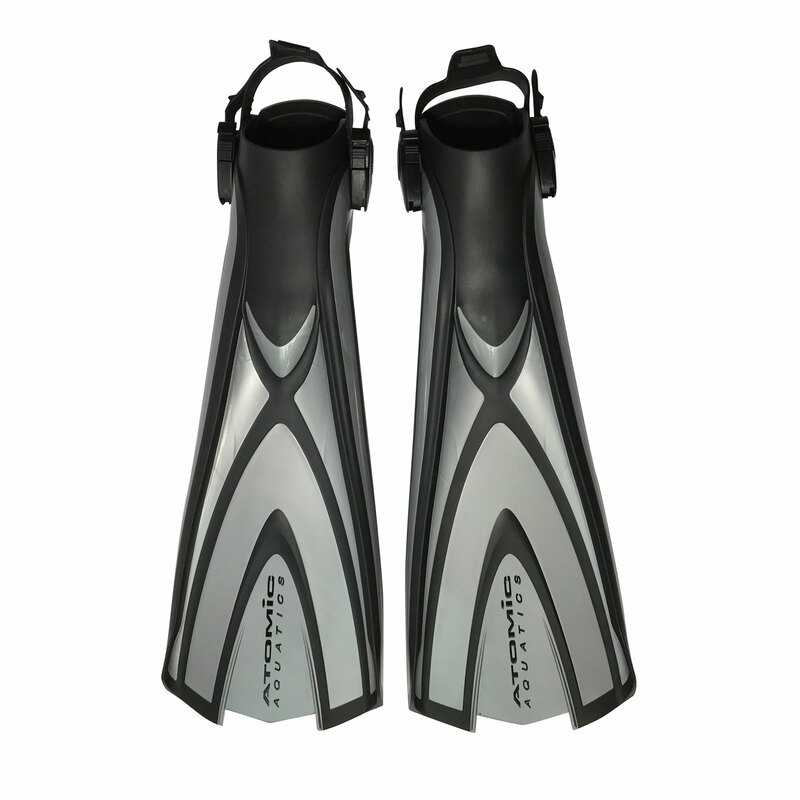 Most fins have taller side rails for tracking and bending strength. 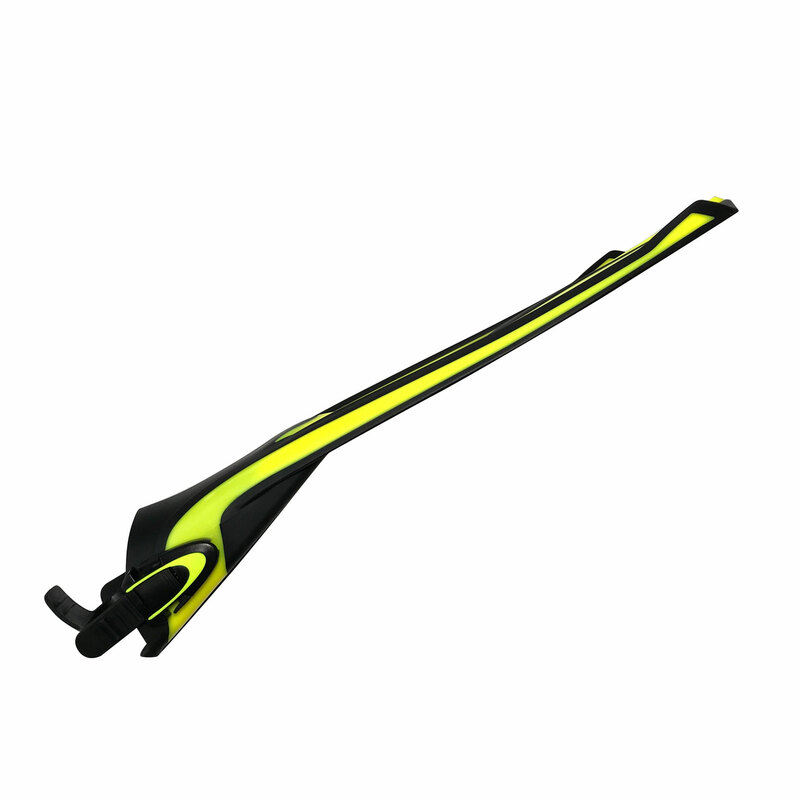 The Atomic X1 BladeFin has lower profile rails with less side-to-side resistance that allow you to rotate, spin and turn more efficiently during alternate fin kicks. 2. Monocoque Structure and Power Plate Unique structural engineering design is connected to the low-profile rails, efficiently transferring power from the leg and foot to the rails. 3. Asymmetrical Blade Bend Flexing This design attribute is perfect for alternate kicking styles. Scissor kicks, frog-kicking and helicopter turning in tight circles put more emphasis on the up-kick or return stroke. 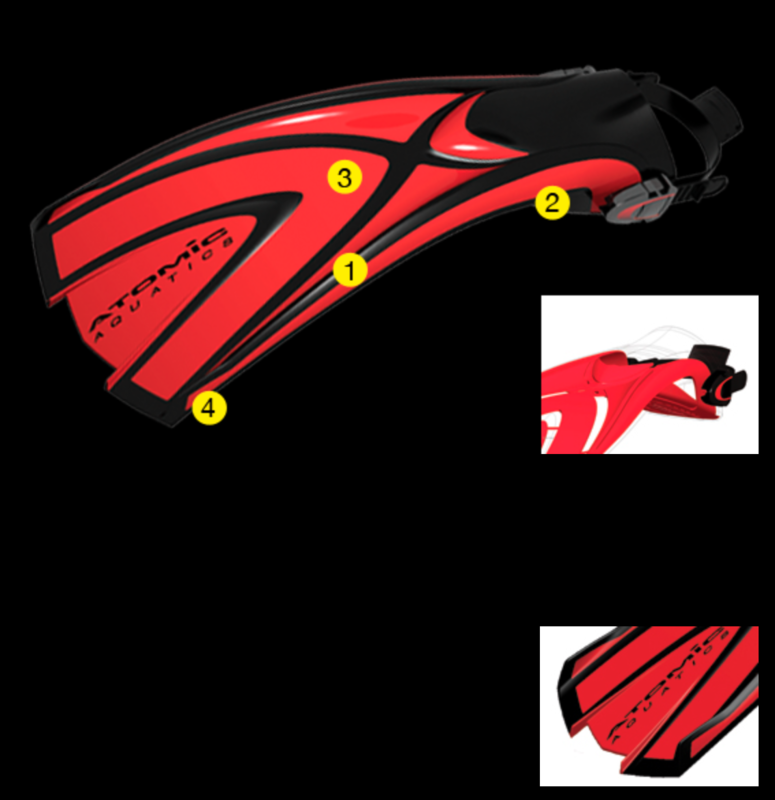 For these kick styles, the X1 provides more feel and control of the fin to maneuver more effectively without folding under heavy load. 4. Vertical Stabilizers or Strakes Adds stability and lowers drag to keep the fin tracking straight as an arrow. Other fin designs use taller side rails to keep the fin tracking straight. 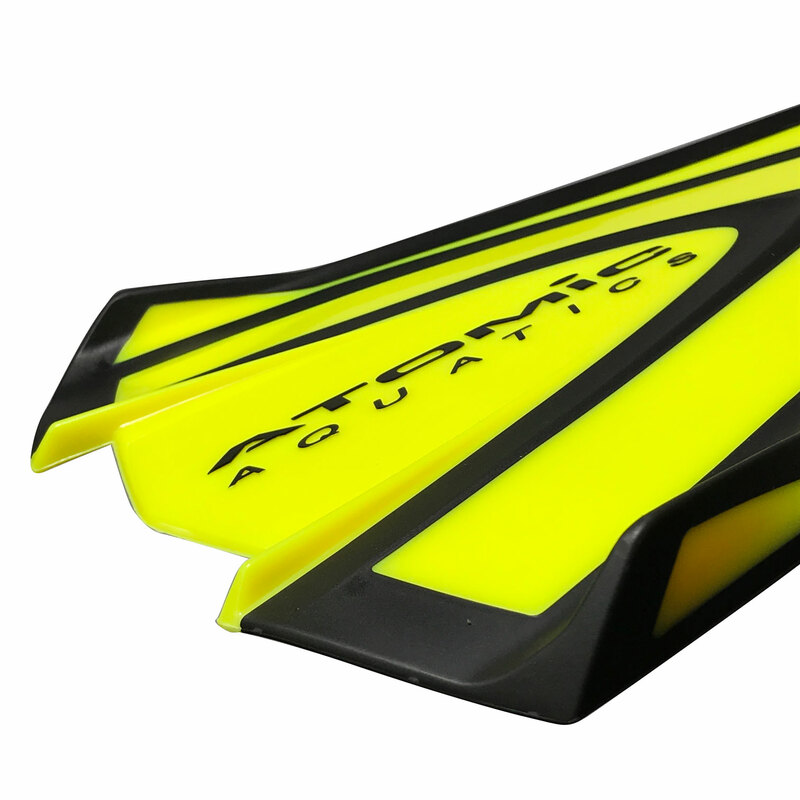 By using strakes to straighten the fin, the X1 BladeFin does not add significant side drag like tall side rails. 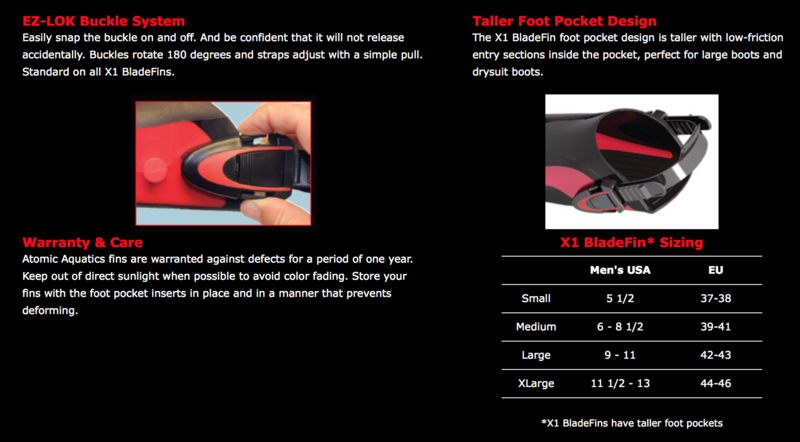 X1 BladeFin Kicking Styles Optimal performance for general purpose diving and alternate kicking styles. The X1 BladeFin has the backbone to control and maneuver in tight spaces, perfect for alternate kicking styles such as helicopter, scissors, backwards, flutter and frog-kicks. Another design attribute of the X1 BladeFin that contributes to improved alternate kicking styles is asymmetrical blade bend flexing which provides more feel and control of the fin to maneuver more effectively without folding. Maximize every kick for raw thrust. Maximize every dollar for great value. Firmer, shorter blade design to maximize kicking power. Solid internal frame delivers more control. 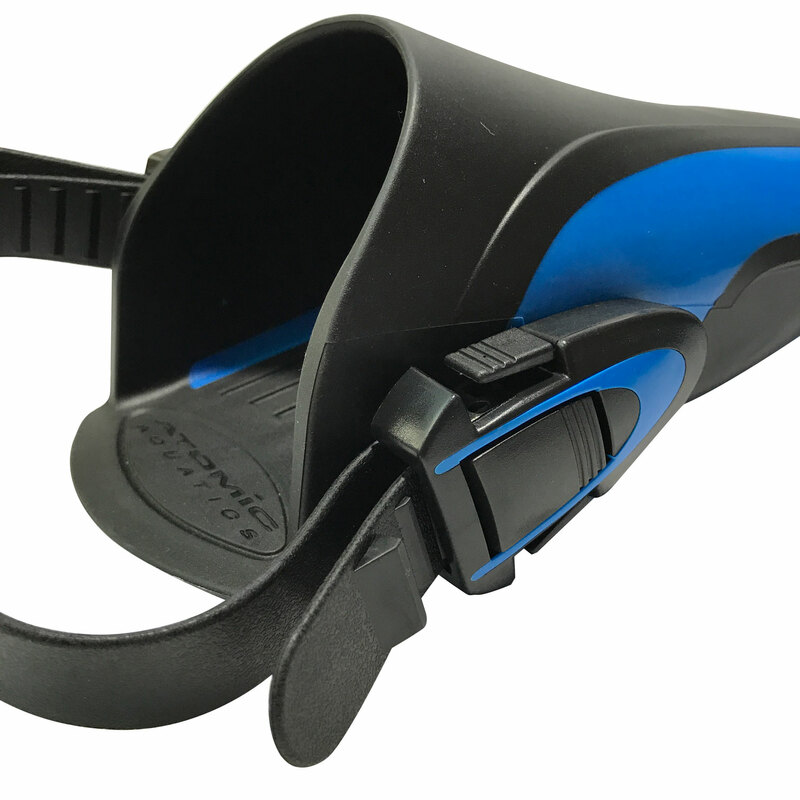 Perfect for general purpose diving, tech diving and extreme applications. Great for alternate kicking styles – helicopter, scissors, frog-kick and more. Legendary Atomic Aquatics design and quality. Optimal performance for general purpose diving and alternate kicking styles.